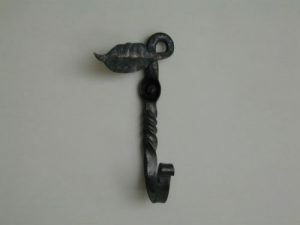 Blacksmithing is a craft that has been practiced for thousands of years. Blacksmiths do not shoe horses; that is a farrier. 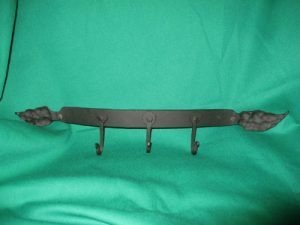 The varieties of items that can be produced with blacksmithing techniques are enormous. In my shop I focus on small items that have utilitarian purpose. The most popular items are small hooks and hangers that have many uses around the house. These items can be made in a variety of sizes and shapes. These are generally classified by the size of the material used. Items made from square stock will commonly have a twist in them to add texture and detail. Black pyramid head screws are provided for hanging. Some variation will occur because of the handcrafted nature of these products. Ironwork that is used outdoors is painted black. If used inside, a wax coating can be applied. Special projects and changes to the sizes of listed items are welcomed.